Monitor Facebook, Twitter, and MORE.. Concerned with Facebook, Twitter, or YouTube activity? Social Spy is the latest, easy to use, social media monitoring tool available for recording EVERY action that occurs on your PC or Mac related to social media. 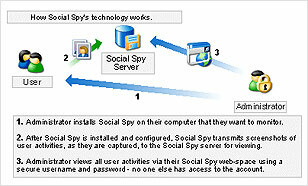 With Social Spy installed you can invisibly record snapshots of social media activity on your PC or Mac while in use. In addition, you can view those snapshots in REAL-TIME through your online account with Social Spy. Seriously how easy is this to use? Simply login to our website with your account information and browse every social media activity that happened on your PC or Mac. This means you can login and view activities from home, your office, a hotel, vacation; literally anywhere you have internet access to login to your account! Social Spy will record snapshots of your computer while in use and then upload them to your online account in real-time allowing you to view these snapshots remotely from literally anywhere with internet access! Social Spy captures screenshots of EVERYTHING a user does on your computer, and then transmits them to your online Social Spy account in real-time for remote viewing. Social Spy's customizable screen capturing can capture screenshots of social networking activities (such as Facebook, MySpace, Twitter, and blog sites), email and chat usage, Internet activities, or EVERYTHING that the user does on your computer. This customizable screen capturing allows you to see what you need to see, without having to browse through other uninteresting activity. Screenshots can be captured and transmitted up to once per second. Additionally, email alerts can be sent to you when specific behaviors occur. View Social Networking Activities on Facebook, MySpace, Twitter, and more! See everything users do - including chats and messaging. View Email and Chat Activities regardless of what email client (including webmail) or chat service is being used! View All Internet Activity including online web searches, website visits, videos viewed, web cam activity, and more. Social Spy sees everything! Receive Real-time Activity Alerts via Email when users visit specific websites, use chat services, participate in social networking sites, or other specified activities. Social Spy is unique in that you never have to access your monitored computer to view activities recorded. This means you will never have to covertly access your employee's or child's computer when they are not around to see what they have been doing on your computer. To view captured activities you simply point your browser to this website and login to your confidential and secure Social Spy account. Screenshots can be sorted automatically by social networking sites and web services, or you can perform quick searches for keywords to find the activities you want to see. ALL captured screenshots can be saved to your computer with a single click. Additionally, screenshots can be played back in an automated slideshow for extra convenience. Search Screenshots for Specific Activities, Keywords, Times, and more. Social Spy is designed to run an in invisible fashion so that it will not alert the user it is running. It will not appear in the Windows task manager or Mac OS Force Quit list, and it will not reveal itself to the user, ever, if so desired. Screenshots are always transmitted 'behind the scenes' so that computer usage is not interrupted. Your Social Spy software and account are both password protected so only you can access them. While being a secure, stealth computer monitoring software solution, Social Spy is incredibly easy tool to use. You only need to enter in your account details after installing and you will be set to start monitoring your computer. Social Spy will work on all versions of Windows and offers 24/7 support via our online helpdesk. Social Spy is a powerful computer monitoring tool that runs on your computer and invisibly captures screenshots of whatever is happening on your computer and stores them in your online Social Spy account for convenient viewing, 24/7. The Social Spy software installs in seconds and only requires you to enter in your account information before it can start monitoring your computer. Once started, it can transmit social networking activities, Internet activities, email and chats, or EVERYTHING the user does. Screenshots are transmitted as fast as you prefer (up to one per second) taking into consideration your internet connection and computer's performance. Once monitoring is started, you can view all captured screenshots via your Social Spy account at any time. Screenshots are searchable, they can be downloaded in an archive format so you can save them all to your computer with a single click, and they can be viewed in an automated slideshow.